Empowering individuals and families affected by domestic violence and sexual assault. Bright Future administers Eagle County’s only 24/7 crisis hotline. Advocates, trained in the dynamics of domestic violence and sexual assault, safety planning, and access to community resources, provide confidential support and referral services to individuals and families. Volunteers play a critical role in our work of empowering victims to become survivors. Opportunities include our 24-hour Crisis Hotline or becoming a Senior Buddy in our Buddy Mentors Program. Bright Future occasionally has openings for new employees, clinical internships and administrative internships. A gift of any level helps Bright Future to provide crucial prevention and intervention programs in our community. We are often in need of in-kind goods or services to benefit our clients, such as clothing and toiletries. Bright Future Foundation is proud to present our 2018 Impact Report. This document serves as a recap of the events of 2017 and 2018, providing a review of BFF activities with an emphasis on financial, organizational, and programmatic developments. 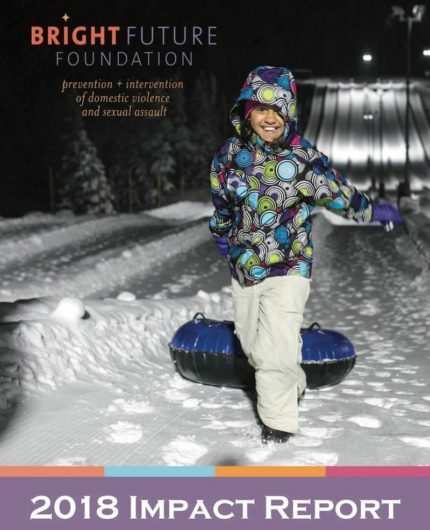 The impact report contains an array of photos, a letter from Executive Director Sheri Mintz, highlights of staff accomplishments, survivor testimonials, stories in the press, lists of donors and supporters, and a financial summary of the past fiscal year. Bright Future Foundation greatly appreciates and relies on the support it receives from volunteers and donors. The annual report is our way of highlighting the organization’s achievements and progress, and it’s one of the ways we say thank you to those who have made it all possible.